SAMSUNG MS23H3125AW Solo Microwave - Black & White. Small Appliances > Microwaves > Standard microwaves. Top features: - Quick and easy meals thanks to the 800 W power - Smart Samsung technologies provide thorough cooking - Easy maintenance means you can spend less time cleaning Quick and healthy meals With 800 W of power and a 23 litre capacity, the Samsung MS23H3125AW Microwave has everything you need to prepare healthy and tasty meals in an instant. The dial and button controls let you navigate settings on the MS23H3125AW with precision and speed. Using the controls you can gain access to the Healthy Cooking menu, providing a convenient way to prepare nutritious meals. The contemporary, ice blue digital display provides essential information about programmes and time, and will add a modern touch to your kitchen worktops. Smart Samsung technologies Samsung's Sensor technology uses smart sensors to monitor your food's surface temperature throughout the cooking process, adjusting the settings accordingly. This clever technology enables you to achieve optimal cooking times and temperatures, so you can dish up food that isn't under or over cooked. Samsung's Triple Distribution System delivers an even distribution of heat so that your ingredients are perfectly cooked through. This great technology makes quick and easy work of heating your favourite foods. Easy maintenance Inside this standard microwave is an antibacterial ceramic lining that makes light work of maintenance. The interior won't scratch or discolour, and makes it simple to wipe away grease and food debris. What's more, the integrated deodoriser on the MS23H3125AW removes odours and ensures food smells are not transferred between ingredients during each use of the microwave. Add accessories to your microwave Liven up your microwave cooking with our range of microwave-safe accessories. Whether you need to warm up your soup for lunch or steam rice and vegetables for dinner, you'll find something to help you create exciting meals in your microwave. The Samsung MS23H3125AW Solo Microwave is loaded with great technology and boasts a sleek and compact design. All Currys/PC World Outlet guarantees are non-transferable. Cavity material: Easy-clean enamel, Deodoriser. Number of power levels: 7. Control panel: Push buttons & dial. Maximum countdown on timer: 99 minutes. Other features: Triple Distribution System, Smart Humidity Sensor, Eco mode, Healthy Cooking menu. Door hinge location: Hinged on left. Box contents: Samsung MS23H3125AW Solo Microwave, Turntable. Internal dimensions: 211 x 331 x 324 mm (H x W x D). External dimensions: 275 x 489 x 374 mm (H x W x D). Boxed dimensions: 348 x 561 x 490 mm (H x W x D). Boxed weight: 13.5 kg. This product has no reviews yet, however see what our buyers say about our other products.. Small box electricals like computers, tablets, camera's, small kitchen appliances. Warehouse/store pick-ups are not available. For more information, read on.. Courier selection is standard and will depend upon value and/or weight/dimensions of the product. Express: DPD - for safe, secure, signed-for deliveries to your door. Unopened - in an as new condition - unused, without installation or data input - in the same condition as supplied to you - complete with any accessories and free gifts offered with it - with the original box and unopened packaging. Unwanted products cannot be accepted after 30 days if any of the above criteria are not met. The right of cancellation does not apply in the following circumstances. Can a Currys or PC World retail store help? Reassuring 12 month guarantee on all products. 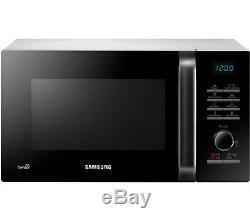 The item "SAMSUNG MS23H3125AW Solo Microwave Black & White" is in sale since Friday, May 20, 2016. This item is in the category "Home, Furniture & DIY\Appliances\Small Kitchen Appliances\Microwaves".